Blue is such a soothing and calming color to have in the garden! An essential shade to balance and tone down the striking brilliance of red, yellow and orange. 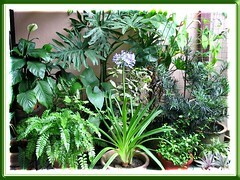 Together with the greens and whites, it gives a cool sense of peace, serenity and tranquility. All the more felt when our garden is relatively small and filled with various kinds of foliage and flowering plants, be it an annual, perennial, sub-shrub or shrub. It’s almost impossible to have a favorite garden color as I love variety! And, blue is definitely included! 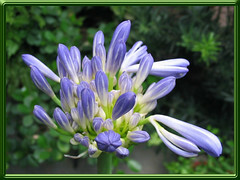 What’s exciting for this month is we’ve added a blue variety of Agapanthus (African Blue Lily) on January 3 to our garden. I’ve seen this beauty on the internet every now and then, but never for a moment thought it possible to find one in our local nursery. This erases my false notion that it is a temperate plant, not meant for our tropical country, Malaysia. 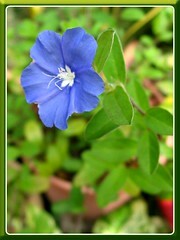 Another blue flowering plant, Evolvulus glomeratus ‘Blue Daze’ joined us last November. Its small tiny flowers are prettily dressed in a fabulous shade of blue and white centers that strikes a lovely combination. Currently, these low-growing plants are grown in small containers but I look forward to propagate some on our garden beds in the near future! 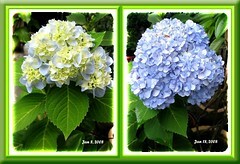 Hydrangea macrophylla ‘Endless Summer’ is another blue on our garden list! A year round bloomer that has not cease to amaze us! 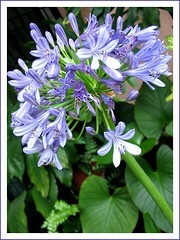 Such fabulous blue delights that has huge and showy flower heads! 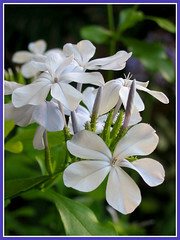 Last but not least is the Blue Plumbago with lovely pale blue flowers. This is quite a vigorous grower and blooms profusely too! Nonetheless, it needs to be trimmed quite often to keep it tidy. Currently, it looks a little too compact after a recent hard trim though I did notice a couple of tiny flower clusters, not worth showing off! On the other hand, I think this article will be incomplete if their pretty flowers are excluded.